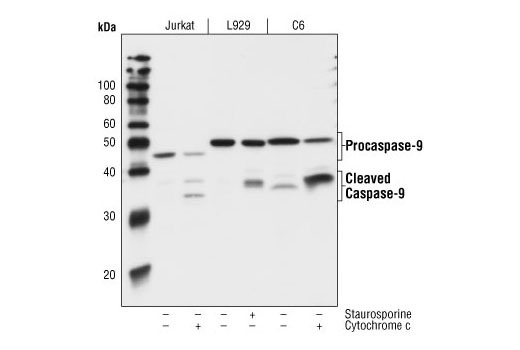 Western blot analysis of extracts from Jurkat cells (human), L929 cells (mouse), and C6 cells (rat), untreated or treated with staurosporine or cytochrome c as indicated, using Caspase 9 (C9) Mouse mAb. Caspase-9 (C9) Antibody detects endogenous levels of the pro form of caspase-9 as well as cleaved fragments. Monoclonal Antibody is produced by immunizing mice with a recombinant human caspase-9 protein.